Surtsey is a volcanic island that was formed in a volcanic eruption in the sea which reached the surface on 14 November 1963. 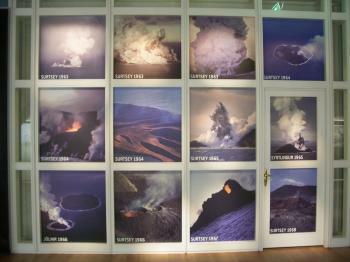 The eruption may have started a few days earlier and lasted until 5 June 1967. The new island was named after the fire god Surtr from Norse mythology, and was intensively studied by volcanologists during its creation and, since the end of the eruption, has been of great interest to botanists and biologists as life has gradually colonised the originally barren island. I was actually there when the eruption started. It was about 5am when a very large underwater noise was heard. I was on HMS Duncan at the time and we immediately went to 'Emergency Stations' as no one knew what was happening. We were all on the upper deck and as dawn broke we saw smoke coming from the surface of the sea. We closed the scene and realised that this was a volcanic eruption under the sea taking place. We and the ship were covered in ash. Amazing experience!!! As indicated in the previous review, a “tourist” visit to Surtsey involving a landing is not possible - and even such visits by scientists are strictly limited. We did however achieve a very close viewing from the sea (around half a mile) during a recent voyage from UK to Greenland. Indeed I even feel entirely “vindicated” in claiming a visit to the inscribed area since this includes a significant marine element as well as the island itself. 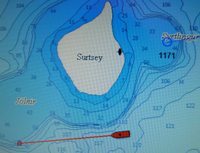 A comparison of my photo of the display screen of our vessel’s navigation system with the map of the inscribed area from the UNESCO site shows clearly our passage within the inscribed boundaries and indeed later included a passage “over” the corner of the now submerged island of Jolnir to the SW of Surtsey. This island, named after another Norse God, emerged with Surtsey in 1963 but rapidly eroded after volcanic activity ceased in 1966. So what did we see/learn from our “sail by”? Well such a rapid visit to Surtsey made solely for that purpose would certainly be hard to justify in cost terms! But we had been visiting the Westmann Islands and Surtsey was on a natural course from them across the Denmark Strait to Greenland. This visit mainly involved the island/town of Heimaey and encompassed such interests as bird life, Norse history, the Westmann “way of life” and of course the famous eruption of 1973 which led to the evacuation of the entire island, the partial destruction of the town and the near closure of the harbour by lava. 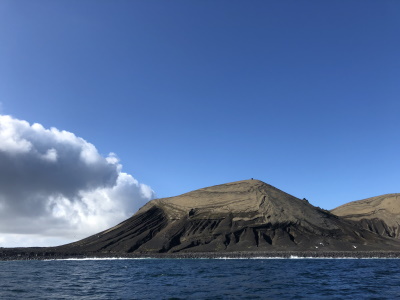 A boat trip out to Surtsey as part of such a wider visit would certainly be justifiable – if you are “doing” Iceland you can get to Heimaey by ferry and there are occasional boat trips out to Surtsey from there. If this trip is important to you it might be worth checking with http://www.vikingtours.is/ since, apparently such tours are not common. The island was a lot smaller and lower than I had expected. There were a few visible human artifacts – a hut for the scientists and a radio mast! The flatter side of the island is, apparently, eroding quite rapidly and the island can be expected to continue to shrink. Grass was clearly visible – it had colonized particularly the well-fertilised sea gull nesting area. Ravens had also moved in quite quickly to take advantage of the available food (Gulls!). We were told that, generally, the colonization by both animal and plant life had progressed more quickly and with greater variety than had originally been expected. But this is no Galapagos or Aldabra 100s of miles from other land. The new land areas of Heimaey created in 1973 may not have been as rigidly free of human influence as Surtsey (parts of the lava near the town received "assisted" plant consolidation) but they too were “sprouting” with life from what were clearly natural causes – and Surtsey is visible from them only a few windy miles across the sea! The island of Surtsey was created by a huge volcanic eruption that lasted from 1963-67. Ever since it broke through the sea its entire life has been rigorously documented and studied, probably the only place on earth that this can be said of. The study has not only revealed how the geology of the island has formed but also how different forms of life have started to inhabit it. It certainly deserves it’s place on the World Heritage List. It is one to add to the list of almost impossible places to visit. Due to the nature of the sight only a very select number of Scientists are allowed onto the island in order to study how life colonises this latest addition to Iceland. It is possible in summer to have a ‘cruise’ around the island, or there are planes that fly from Reykjavik to give an overview but these are pretty expensive (Iceland isn’t a cheap destination) and perhaps only really rewarding for the specialist/ completionist. The best bet is to head for Reykjavik’s excellent Culture House, the top floor of this small museum is dedicated to Surtsey (the ground floor has an astounding display of early Icelandic manuscripts, including many of the oldest known versions of the Saga’s) specifically to tie in with the nomination as a world heritage site. It is a great exhibition there is an interactive display that illustrates how the island has changed throughout its life, from size and shape to how it has been colonised by flora and fauna. There are also specimens from the island, photo’s, 3-D maps and perhaps most enjoyably a large projection of the footage screened of the islands violent birth. This is a great museum not to be missed, and about as close as most will come to ‘visiting’ Surtsey. Not open to tourists: Only open to scientists.